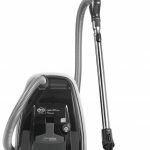 This lightweight Hoover cylinder vacuum cleaner will effectively pick up dust across a variety of floor types. The dust bin is easy to empty, whilst the bagless technology saves you money on the ongoing cost of a vacuum cleaner. An included Pet Turbo brush will effectively clean up after your furry friends. A two-in-one Crevice and Dusting tool offers a handy solution to cleaning in awkward corners. The Hoover SE71_VX05 Cylinder Bagless Vacuum Cleaner- Silver, Blue is currently out of stock. If you would like to know when we can get this product delivered to you, simply enter your contact details below & we will reply to you shortly.